It’s sad when it gets to the point where seeing a headline about a pet sitter losing a dog immediately makes you think of the name “Wag,” and in the vast majority of cases, you were right. Unfortunately, here we are again. 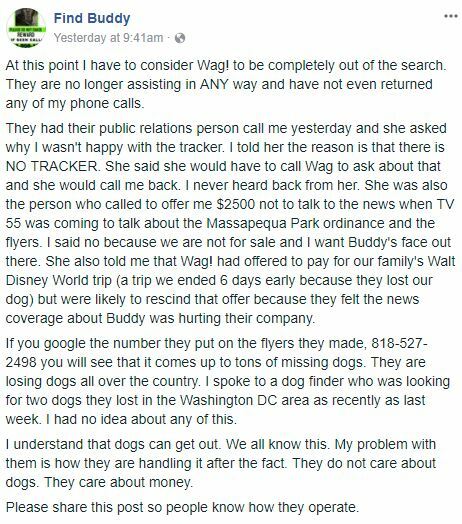 A Wag pet sitter lost a dog they were caring for on Long Island on Wednesday, September 20, and they’re still looking for him. 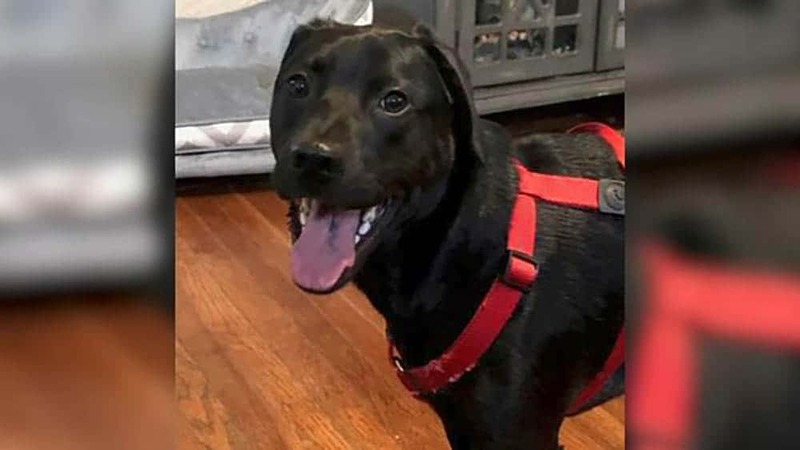 Buddy, a beautiful lab/beagle mix from Wantagh, got away from their Wag sitter while the owners were away at Disney World. It’s the phone call a pet owner never wants to hear, and the family is searching for him frantically. Naturally, the sitter feels terrible about it too, and Wag is offering a reward for the dog’s return. But this does not change what we’ve been shouting from the hilltops: The “Uber for dog walkers” model used by companies like Wag and Rover is not and never will be suitable for the pet care industry. As we’ve outlined before, companies like Wag have a fundamental disconnect with the sitters and walkers registered to their app, and because they’re enjoying big savings on payroll taxes by classing their sitters as independent contractors, they are severely limited in the amount of oversight they can give. For example, IRS rules say that they are forbidden to train their walkers – they can’t even give them an employee manual. And they cannot enforce basic safety procedures like having their dog walkers use safety clips when walking dogs to minimize the chance of them breaking free. Whilst no dog walker or pet sitter is 100% immune from accidents or mishaps, remember you can greatly reduce the chance of something like this happening by using a professional dog walking service with trained employees instead of rolling the die by hiring a sitter from an Uber-style app. We sincerely hope that Buddy returns to his doting owners and we wish them all the best in their search. 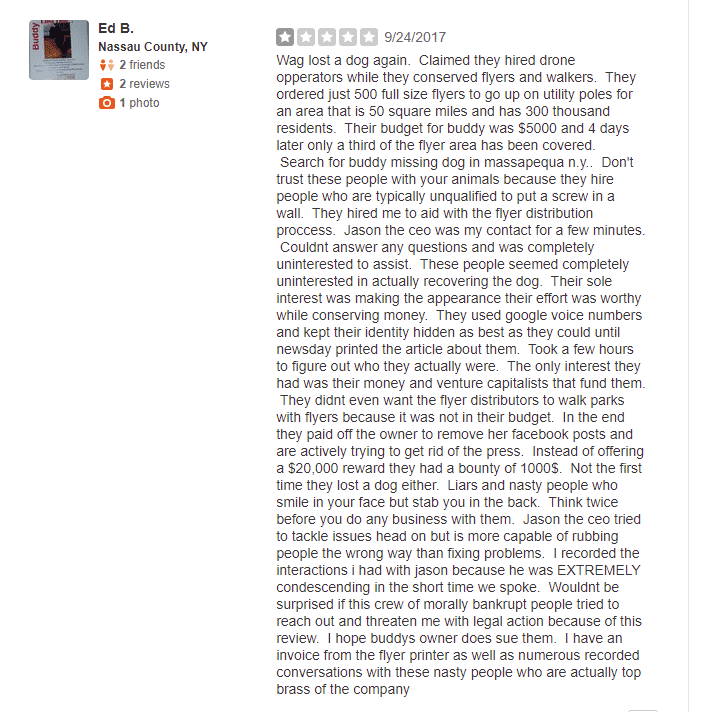 EDIT: We found this review (click through to the filtered reviews at the bottom) by a Yelp user named Ed. 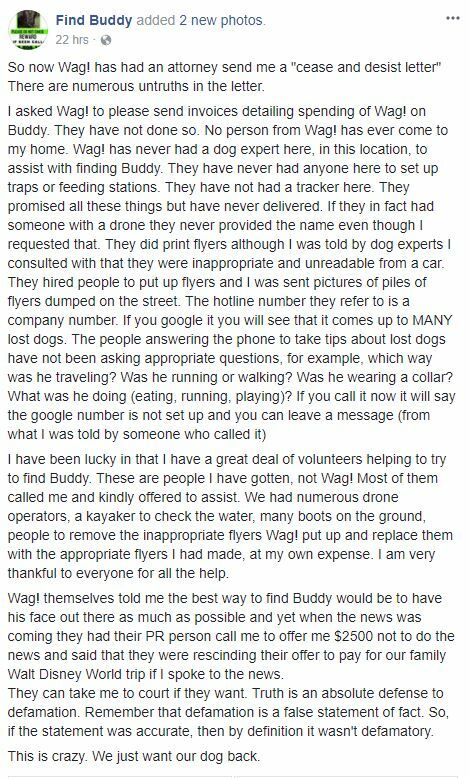 B who claims to have been recruited by Wag to distribute the flyers to find Buddy. If what he describes is true, it paints a picture of Wag not as a company of animal lovers concerned for the welfare of a dog, but as a corporation engaged in a frantic exercise in public relations and damage control. Here is the text of the review (we can’t verify anything said here, so read with the same caution you’d approach any Yelp review). Wag lost a dog again. Claimed they hired drone opperators while they conserved flyers and walkers. They ordered just 500 full size flyers to go up on utility poles for an area that is 50 square miles and has 300 thousand residents. Their budget for buddy was $5000 and 4 days later only a third of the flyer area has been covered. Search for buddy missing dog in massapequa n.y.. Don’t trust these people with your animals because they hire people who are typically unqualified to put a screw in a wall. They hired me to aid with the flyer distribution proccess. Jason the ceo was my contact for a few minutes. Couldnt answer any questions and was completely uninterested to assist. These people seemed completely uninterested in actually recovering the dog. Their sole interest was making the appearance their effort was worthy while conserving money. They used google voice numbers and kept their identity hidden as best as they could until newsday printed the article about them. Took a few hours to figure out who they actually were. The only interest they had was their money and venture capitalists that fund them. They didnt even want the flyer distributors to walk parks with flyers because it was not in their budget…..Instead of offering a $20,000 reward they had a bounty of 1000$. Not the first time they lost a dog either. Liars and nasty people who smile in your face but stab you in the back. Think twice before you do any business with them. Jason the ceo tried to tackle issues head on but is more capable of rubbing people the wrong way than fixing problems. I recorded the interactions i had with jason because he was EXTREMELY condescending in the short time we spoke. Wouldnt be surprised if this crew of morally bankrupt people tried to reach out and threaten me with legal action because of this review. At this point I have to consider Wag! to be completely out of the search. They are no longer assisting in ANY way and have not even returned any of my phone calls. They had their public relations person call me yesterday and she asked why I wasn’t happy with the tracker. I told her the reason is that there is NO TRACKER. She said she would have to call Wag to ask about that and she would call me back. I never heard back from her. She was also the person who called to offer me $2500 not to talk to the news when TV 55 was coming to talk about the Massapequa Park ordinance and the flyers. I said no because we are not for sale and I want Buddy’s face out there. She also told me that Wag! had offered to pay for our family’s Walt Disney World trip (a trip we ended 6 days early because they lost our dog) but were likely to rescind that offer because they felt the news coverage about Buddy was hurting their company. If you google the number they put on the flyers they made, 818-527-2498 you will see that it comes up to tons of missing dogs. They are losing dogs all over the country. I spoke to a dog finder who was looking for two dogs they lost in the Washington DC area as recently as last week. I had no idea about any of this. I understand that dogs can get out. We all know this. My problem with them is how they are handling it after the fact. They do not care about dogs. They care about money. Please share this post so people know how they operate. This account, if true, paints a depressing picture of the reality of what happens when you scale pet care to the level of a national corporation. People commenting under the post have said that Wag are removing any comments made about Buddy from their social media pages. I guess they’re in full damage limitation mode. UPDATE: According to MaryEllen and as reported by the Daily News, Wag is so upset about her relating her experiences with them online that they’re now threatening to destroy her with lawyers. How this must feel when you’re already reeling with grief and worry with the loss of a beloved pet is not hard to imagine. The online dog boarding service that lost a Long Island woman’s beloved pooch last month is demanding she stop growling about the company. Wag! — which describes itself as Uber for dogs — sent a cease and desist letter to Marry Ellen Humphrey Wednesday commanding her to take down her scathing social media posts. “If your retraction and apology to Wag! are not publicly posted to each and every social media platform that you have used to libel Wag! within 24 hours of the time of this email, this office has been authorized to use all available means to bring as swift as possible an end to your lies,” said letter from company attorney Mark Warren Moody. UPDATE: Buddy has been found! Not by Wag, of course….